VSDC Free Audio Converter press release. It is new audio converison software. Free Audio tools for conversion, editing, all the basic possibilities of cutting, audio effects and more. Free versatile audio conversion tool offers wide conversion capabilities from and to virtually any audio format. Flash-Integro LLC announces the recent release of a brand new tool in the line of media software developed by the company. 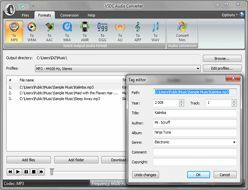 VSDC Free Audio Converter is a free tool for total audio conversion from and to virtually all key audio formats available. The conversion process is smooth and intuitive: a user selects files he or she wants to convert to another format, then clicks a button and rest of the work is done automatically. While the program features quick and high-quality audio conversion, the process is highly customizable as well. Flexible conversion settings plus a bunch of presets allow a user to obtain the finest audio quality regardless of the conversion direction and input and output formats. VSDC Free Audio Converter natively supports MP3, WMA and ASF, M3U, MOV, MP4 and M4A, RM and RA, OGG, AMR, VOC, AU, WAV, AIFF, FLAC, OMA formats for conversion, while the built-in trimming option allows you to cut off unnecessary chunks from a file. Due to complete support for Core 2 Duo, Dual Core and Hyper-Threading technologies, VSDC Free Audio Converter works blazingly fast, and the bullet-proof stability guarantees reliable and effortless audio conversion. “We put much efforts into extensive testing of our program on multiple hardware configurations and operating systems”, says the director of the company, “to make sure our users won’t put any efforts using it”. As the name suggests, VSDC Free Audio Converter is totally free and doesn’t contain any hidden fees nor does it have adware components. A number of additional options like the built-in tag editor, or an ability to extract an audio track from any video file complete the list of program’s capabilities making it a truly versatile audio conversion solution.